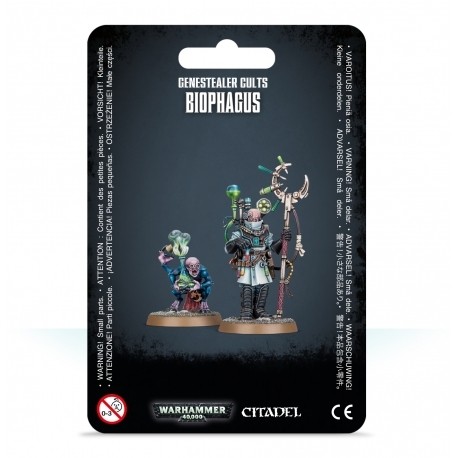 A Genestealer Cult is a community of Genestealers, Genestealer hybrids, as well as the completely human convert-hosts, infected victims and genetic relatives known as Brood Brothers, existing secretly within another society. Cults form if a Genestealer infects members of another species with its genotype. The resultant changes in the genome of the host cause a fanatical loyalty to the Genestealers as well as a drastic change to their reproductive system; their firstborn children will be Hybrids, a grotesque mixture of the host's race and Genestealers. These hybrids infect further victims, and the infection spreads exponentially. Fourth generation hybrids produce Purestrain Genestealers, and the cycle starts once again. The resulting brood of Purestrains, hybrids and Brood Brothers is held together by strong psychic and genetic bonds and assembles around the original Genestealer which becomes the Patriarch. Because the cult is often hidden behind the facade of a religion or political movement, it is branded a Genestealer Cult by the Imperium. A Genestealer Cults Biophagus is able to enhance Aberrants, making them stronger, tougher or grant more attacks.